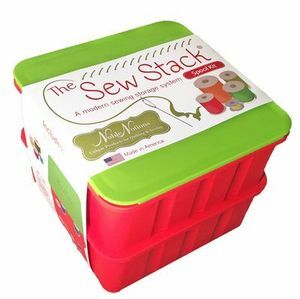 The Sew Stack is a modern, high quality approach to storing and organizing bobbins and thread spools. With the interlocking modular storage options, new trays can be added in any combination. The combo kit comes with a bobbin tray that holds up to 40 bobbins and the spool tray holds 16 standard size thread spools. The Sew Stack is made of soft touch, flexible material that is latex free. The unique design of The Sew Stack allows for ultimate organization while preventing bobbins and spools from getting tangled or falling out when turned upside down or dropped. There are three kits to choose from. Buy any combination depending on your personal needs. - 2 spool trays and a lid. Item does not include bobbins or thread spools. The Sew Stack is not intended for use with cone style or large thread spools.